The owners were excellent at keeping in touch, and sent very clear instructions. They responded to my emails immediately. The property was beautifully presented and in a great position. Villas are extremely well maintained. Spacious rooms, fully equipped. Simple, modern interior and design, of extremely good taste. Relaxing beds, mattresses, pillows and quilts are extremely neat, clean and fresh smelling. Facilities for the disabled. Free parking area in the property. Value for money. Late check out, availability. The whole place generates emotions of peacefulness, serenity and privacy. The situation, the peace and quiet, the buildiing itself, the Interior and exterior decor, the amenities, the very helpful and friendly staff, the cleanliness, being in nature with the birds and the sheep. Everything was good and even exceeded our expectation. Good location among the hills with olive trees and with the view on the sea. Next to villa lived a herd of sheep, but they did not annoying us, rather made living in the villa more naturally. Good facilities inside the villa . thanks a lot for Deppie hospitality even we had not seen her - everything was pre arranged to our visit and we had all necessary support and instructions by email . Good place, nice owner, great sand beach (few 2-3 km from Methoni). Good kitchen. We spent wonderfull days at this place. We had the most outer house with free view over the hills and sea. The interior is done with lots of attention to details. The owners are wonderful; we had some problem with the bathroom which they took care of right away. We needed a blender and they brought it. very charming place. Comfort, everything very clean and well maintained. Nice decor and spacious. Welcome coffee, tea, cookies and jam. Attention to customer satisfaction. Sehr nette und aufmerksame Vermieter und Personal, super Betreuung von der Buchung bis zum Ende der Reise. Il complesso è bellissimo, gli appartamenti, arredati con gusto e molto ampi, invitano ad una permanenza ben superiore alle poche notti. Tutto curato nei minimi dettagli, ogni appartamento offre una bellissima vista sulla vallata di ulivi ...insomma un posto di totale relax dove sentirsi dei nababbi! Lock in a great price for Afentiko Pigadi – rated 9.6 by recent guests! Set on a serene hillside overlooking the Ionian Sea and surrounded by endless olive groves, Afentiko Pigadi is located in Methoni, 13 mi from Costa Navarino. Each individually styled villa is made with local stone and features modern interiors. There is also a seating area, kitchen, fitted with an oven. A toaster, a refrigerator and stovetop are also provided, as well as a coffee machine. Towels and bed linen are available. Within a 5-minute drive, you can reach the vilalge of Methoni, the famous Venetian Fortress and many beaches. Pylos is 6.8 mi from Afentiko Pigadi. Kalamata is 25 mi away. Free WiFi is featured throughout the property and free private parking is available on site. When would you like to stay at Afentiko Pigadi? 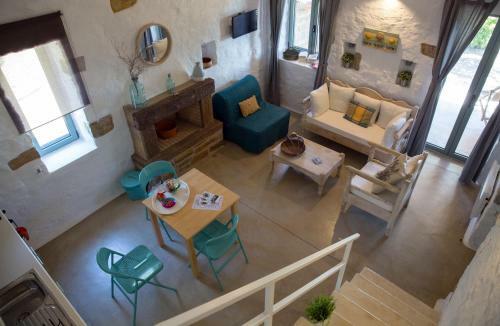 Afentiko Pigadi consists of four independent luxury villas with communal surroundings. The villas were built in 2015 with great care, respect to the natural environment and attention to detail. Each villa has its own unique decoration and style. Where modern amenities meet the traditional architecture, we invite you to relax and enjoy your holidays. An architect, a civil engineer and two managers formed a happy and friendly family business. Under this manner, the owners and the staff look forward to give their best in order to offer you a rememberable vacation. Surrounded by endless rows of silver-green olive trees, Afentiko Pigadi’s four independent villas are located on a serene hillside overlooking the Ionian sea. 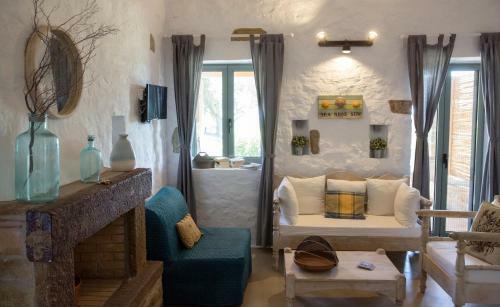 Made from local stone and with great respect to the unique Peloponnesian landscape, the villas are designed as a natural continuation of their surroundings. The famous perennial olive groves, mix with Afentiko Pigadi’s herb garden. The smell of lavender, thyme and oregano surround the visitor, and the eye travels from the small bunches of orange and lemon trees down to the crystal clear blue of the sea and Methoni’s little islands – Sapienza, Agia Marina, and Schiza. The lightest and sweetest summer dreams are made out of Messenian sun and the light blue of the Peloponnesian sky. House Rules Afentiko Pigadi takes special requests – add in the next step! Afentiko Pigadi accepts these cards and reserves the right to temporarily hold an amount prior to arrival. Please note that towels and sheets are changed every 3 days. Please inform Afentiko Pigadi of your expected arrival time in advance. You can use the Special Requests box when booking, or contact the property directly using the contact details in your confirmation. No reception services, though communication through emails and phone calls was clear and as often as needed. The outside area is not yet fully shaped though the whole place generates emotions of peacefuleness, serenity and privacy. ĺIt was rather disturbing when there was a power cut, but the staff were very helpful and it couldn't be helped due to a storm. A heater was required in the bathrooms for colder days. The staircase is open, thus risky for small kids. A daily cleaning service would have been desired, even at a small surcharge. To keep temperature in 24-27 range during the day you have to turn on 2 air conditioners at the morning and keep them working until night.